SEAN: I had forgotten that Midtown, for some odd reason, hates Seven Seas and doesn’t get their books in for ages. So I’ll add the books that came out via Diamond this week to next week’s list. So what is on that list? 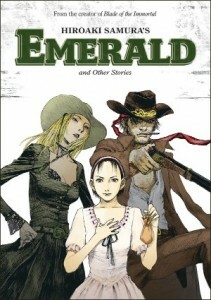 Dark Horse has a short story collection by Hiroaki Samura, creator of Blade of the Immortal, entitled Emerald And Other Stories. It will come as no surprise that these stories are about Samurai in some way, shape or form. Sounds similar to the recent Kaoru Mori collection, only with samurai replacing maids. Fun! ANNA: I have the first few volumes of Blade of the Immortal but never got into it as much as my beloved Vagabond. I think I have room in my heart for only one long-running samurai series. That being said, I might check this out because I did really enjoy Samura’s short story collection of college life, Ohikkoshi. MELINDA: I can’t decide if I’m interested in this. I don’t love samurai or short stories, but I have always wanted to try Blade of the Immortal, and maybe this would give me the push I’ve needed to dig in. MICHELLE: I read the first volume of Blade of the Immortal and thought it was awesome, but somehow I have never continued with it. I think it’s ‘cos I have to brace myself for the gore I might encounter, which is why I’ve not continued with Kurosagi Corpse Delivery Service, either, despite liking the first volume. Anyway, Emerald and Other Stories sounds pretty interesting and not too full of samurai, if Amazon’s description is to believed. I might have to check this out! SEAN: Kodansha has what I believe is the final volume of Deltora Quest, the manga adaptation of Emily Rodda’s books that ran in one of Kodansha’s younger titles, Comic Bom Bom. MICHELLE: I read the first volume of Deltora Quest, which was sufficient to convince me that I didn’t need to read any more volumes of Deltora Quest. SEAN: Coming out this week via Diamond and Amazon, and sometime whenever via Midtown, Seven Seas has a new Alice series debuting. Alice in the Country of Joker: Circus and Liar’s Game is a much darker take on a series that can get pretty dark already, and pays more attention to the mystery of Alice’s older sister. ANNA: I didn’t enjoy Cheshire Cat Waltz very much, but I still have a certain amount of affection for the franchise and would probably read this if some other reviewers think it worthwhile. MICHELLE: I had no idea there was a Country of Joker incarnation! I think I have at least sampled all of the versions, but this one sounds more promising than most. SEAN: There’s also the 2nd volume of Haganai: I Don’t Have Many Friends. Of Seven Seas’ three moe titles this fall, this is the only one I bothered to get a second volume of. It’s on probation, however, so we’ll see if it improves any. MELINDA: I’m really trying to give Awkward Silence the benefit of the doubt, mainly because of its author. But I’ll admit that volume one did not give me a lot of confidence that this series will transcend its cover art. Anyone want to offer me some hope here? I’ve got both volumes two and three sitting here staring at me. MICHELLE: I found the first volume to be really generic, if not outright terrible, and was surprised that Takanaga’s been able to sustain the premise for multiple volumes. So, I guess I’ve no hope to offer you. SEAN: Vertical has the debut of a new sci-fi manga from the creator of Biomega and Blame!. 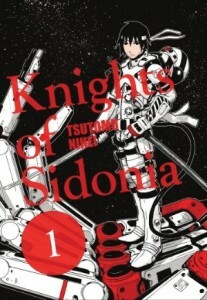 It’s called Knights of Sidonia, and the advance buzz on it has been excellent. It runs in Kodansha’s Afternoon, but is probably not very much like Oh My Goddess! at all. ANNA: Is there a bear with a machine gun in this manga? That’s my main question. I will pick this up, because I want to support Vertical on principal but not all of their titles appeal to me. Anything from the person that created Biomega is something I am interested in for sure. MELINDA: I am totally there. This looks really interesting to me. MICHELLE: I really enjoyed Nihei’s grimly compelling BLAME!, so I was predisposed to be interested in this, but the phrase on the back cover that really clinched it for me was “the spaceship’s cool-headed female captain.” Sign me up! ANNA: I read the first volume and liked it well enough, but it didn’t inspire the kind of loyalty I would need to feel to keep reading such a long series. MELINDA: I’ve wanted to try this series for years, so you keep on supporting it, Sean! I’ll fall in line eventually! MICHELLE: I have to admit, it’s the artwork on this that keeps me away. It looks fairly moe-tastic. SEAN: And Inu Yasha continues to get its VizBIG re-release, with Vol. 14 covering volumes…. um… (does math) 40-42 of Takahashi’s most popular (in North America, calm down, UY fans) series! MICHELLE: Yay, InuYasha! I actually still need to read the final ten volumes of this; I’ve sort of been hoarding them until I’m ready for it to actually be over after all this time. SEAN: So what’s your Valentine manga?